Originally announced at the beginning of 2014, Game Insight has released The Tribez & Castlez on iOS and Android devices. 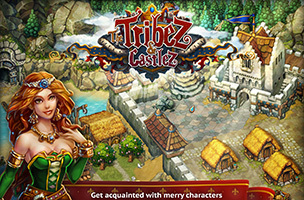 The game is a spin-off of the company’s popular original game The Tribez (our review), which has been downloaded by more than 14 million players worldwide. In The Tribez & Castlez, players travel to a medieval land of magic, where they’re challenged to help a prince rebuild his kingdom. The Tribez & Castlez is set in the year 1450, and sees players building their own kingdom, constructing homes to recruit workers, farms to grow food and more. Players can clear trees, stones and other debris from the land to collect resources, and must balance the use of money, wood, stone and more to construct new buildings and complete quests. As players complete tasks and level up, they’ll unlock land expansions and will further the game’s storyline, which includes visits to dungeons and wizard towers. Players will need to defeat monsters set on destroying their kingdom, and can eventually unlock secondary structures like sawmills and factories, which generate greater items than individual farms or trees can produce. What’s more, these individual structures can be upgraded, unlocking additional resources for production within each. For instance, starting farms can only grow eggplants, but by upgrading them, players can grow sunflowers, tomatoes and eventually grapes. The Tribez & Castlez offers multiple ways to spend real money, like speeding up the construction of buildings or the growth of crops. As kingdoms become larger, players can also spend premium currency to collect from every “ready” building or object at once. The Tribez & Castlez is now available to download for free on iOS and Google Play. The game will be released on the Amazon App Store and Facebook in the near future. Check back soon to follow The Tribez & Castlez on AppData, our tracking platform for mobile and social apps and developers.